I have been using ASP.NET MVC extensively over the past year, and the more I use it, the more I like it. However, there remain a couple of things that bug me. One is the fact that the built-in validation doesn’t work with repeating forms. The other is the “best practice” of placing Data Annotations on a ViewModel class. For me, validation rules belong on the business object itself, not on the ViewModel. One of the key benefits of encapsulation is that we reduce code duplication. If we don’t encapsulate the validation rules inside the object, then we are doomed to repeat them once for every presentation layer. 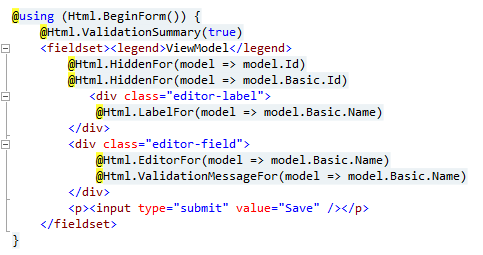 Data Annotations in an MVC ViewModel are not available to a WPF UI. Not only does this lead to redundancy, it increases the risk of inconsistencies cropping up between UI. So no problem, you might think. All we have to do is add the Data Annotations to the Model itself, and then add the Model as a property of the ViewModel. What happened to our “Basic” Model property? It’s not there. The scaffolding only seems to work for simple properties. As you can see, the Model has successfully been bound, so we now have a mechanism for taking advantage of ViewModels without sacrificing encapsulation. For related information, check out Building Web Applications with ASP.NET MVC from Learning Tree. I recently came an across an interesting problem: I had to post an ASP.NET Web Form to a third party Web site. It turns out to be quite a tricky thing to do – so I thought I’d share my solution with you in case you ever need to do the same thing. First off: why did I want to post on rather than back? I am in the process of taking over responsibility for an existing Web site. The site integrates with a bank to take credit cards – and the data needs to be posted. So why not just use HttpWebRequest? Because the user has to leave the site, pay and then come back – bringing return parameters back with them. Ok – so how did the current site work? It cheated. It’s an ASP.NET Web Forms site, but the page that does the posting is actually PHP! So – what exactly is the problem with just switching to an ASP.NET Web Form? ASP.NET Web Forms post back to the same page (or, at a pinch, to other pages on the same server). They don’t post on to third party web sites. Q: So how did I make it work? Hid the label using jQuery, then showed a button (input type=”button”, not submit) and set its click event to…. Rewrite the control names so that they met the remote sites requirements. Then all I had to do was test it – which I did by creating a page to echo the newly posted values back to the (which also meant I had to set EnableViewStateMac=”false” on the test page). So there you have it – a way to post to a remote server from an ASP.NET Web Forms Web site. Ever wanted to do a wildcard Search and Replace in Visual Studio? I don’t just mean finding things using wildcards, but selectively replacing part of what you find while leaving other parts untouched. I came across an example recently where I needed to do just that – and since what I discovered saved me an inordinate amount of work, I thought I’d share it with you. I was asked to look over the code for an ASP.NET Web Forms web site with a Sql Server back end. When I looked into the code, however, I discovered that the database was actually MySql… which I don’t support. I managed to migrate the database over to Sql Server, but then found that although the project used NHibernate, much of the data access code was written as inline SQL in the code-behind pages. And that code wouldn’t work with Sql Server. And there were a huge number of column names and GetXXX() methods that needed changing. So I did a little research, and discovered that there’s an option to use regular expressions in the Find and Replace dialog. And change all the GetStrings() for all of the columns in one simple Find and Replace – thus avoiding a great deal of tedious and repetitive work. Here’s hoping I’ve saved you some of the same. Recently, I’ve been writing iPhone applications. The iPhone development tools are great and Objective-C is fun. Sooner or later though, an iPhone app will need to get data from a server. That’s where .NET and WCF come in. WCF is a full-featured, highly automated way of creating Web services that run on Windows servers. However, if you are writing a service for the iPhone, there is one important thing to be aware of. In iOS, there is no built-in support for SOAP services which are the default type of services in WCF. So, your WCF services will need to be RESTful. Luckily, WCF makes this simple. I’ll walk you through the easiest way I know of to do this. First, create a project with Visual Studio and choose the ASP.NET Empty Web Application template as shown below. Once you have the project, select the Project | New Item menu. Then, choose AJAX-enabled WCF Service from the list of templates as shown below. By choosing that template, the service is automatically configured as a RESTful service using the webHttpBinding binding and supports simple http get requests. An example Web.config file is shown below. Note the binding attribute in the endpoint configuration. Now it’s time to write a service. Just create a function in the service’s code behind file and mark it with two attributes, OperationContract and WebGet. See the example code below. One thing to note is the default return type when using the WebGet attribute is JSON. If you prefer to return XML, you can change the attribute as shown below. That’s it. Now you can invoke that service using a standard http request from Objective-C. If you want to learn how to do that though, you’ll need to come to Learning Tree’s course, iPhone® and iPad® Programming (this blog is about .NET programming after all). I was teaching an ASP.NET MVC class just before Christmas, and was forcefully reminded of two things – 1) ASP.NET MVC Routing can be really tricky to get your head around, and 2) a surprising number of people still aren’t familiar with NuGets and don’t take advantage of them. So this blog post is designed to kill two birds with one stone. I’m going to introduce NuGets and show you one in particular that helps you become familiar with the routing engine. First up: what is NuGet? 1. Open a project to which you want to add a NuGet (in this case, the routing debugger). 3. That brings up the NuGet dialog. 4. You then search for the NuGet you’re after (in this case, the route debugger by Phil Haacked) and then click on the Install button once you’ve found it. 5. Now all you have to do is use it. In this case, that means running your application and using the useful debugging utility to see which of your routes matches the address in the browser. A great way to learn more about routes and test whether your routes really do what you think they’re doing…. (I’d advise using this one on a learn-routing project rather than a real site, by the way). NuGets – they’re easy to use, and there’s one out there that’s just what you need. ASP.NET MVC 4 will include a neat little feature allowing you to create mobile views very easily. All you will have to do to mobile-enable a view is add ‘mobile’ to its name and then customize it for mobiles. How you customize it is up to you – but the built in Visual Studio MVC 4 templating will be using jQuery mobile (hurray!). If you have a file called “index.cshtml”, you would copy it and create the new file “index.mobile.cshtml”. If you have “index.aspx” then you would create “index.mobile.aspx”. These then sit side-by-side with your standard views. Internally, ASP.NET MVC will detect that a mobile device is being used and direct the request to the appropriate view. All in all, a useful little NuGet which sets you up for developing mobile apps in ASP.NET MVC 4. Windows 8 will include a new Start screen similar to Windows Phones. The Start screen will have tiles that represent programs. Clicking on a tile will start the program. The thing that makes a tile different from an icon is a tile can contain live information. For example, the tile for an e-mail program might include the number of messages in the in-box. Tiles are also big. This allows them to not only contain live information, but also makes them optimized for touch screens. When a tile is selected, a traditional Windows application or a Metro-style application might start. Traditional Windows applications will run on the Windows desktop. Metro-style apps will run in full screen, like an application on a phone or tablet. Metro-style apps will also have their own controls and idioms optimized for touch. Microsoft has claimed that in a couple years nearly all computers will have touch-enabled screens. First, Microsoft is not “killing” Silverlight. Silverlight will be used where appropriate. For example, when a program needs to run on both a PC and a Mac. Third, the .NET Framework is not going away. WinRT applications will still need to access services, write to databases, and not all applications will be Metro-style applications. 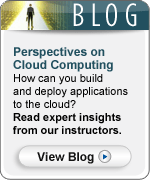 Windows 8 and Metro-style apps offer exciting new opportunities for developers. Whether you are a C++, Web or .NET developer, you will be able to leverage your existing skills to create great new applications for you users. If you want to learn more about developing Windows applications using XAML come to Learning Tree course 975: WPF and Silverlight Introduction: Hands-On.